NextCloud is an open source file synchronization and sharing solution, the fork of ownCloud. It is like a Google Drive / Dropbox that permits you to store and share your documents, pictures, and videos in a centralized location. Linux: Ubuntu (18.04 & 16.04), Redhat Enterprise Linux 7/6, CentOS 6 / 7, Debian 9. Database: MariaDB or MySQL, PostgreSQL 9 / 10, Oracle 11g. 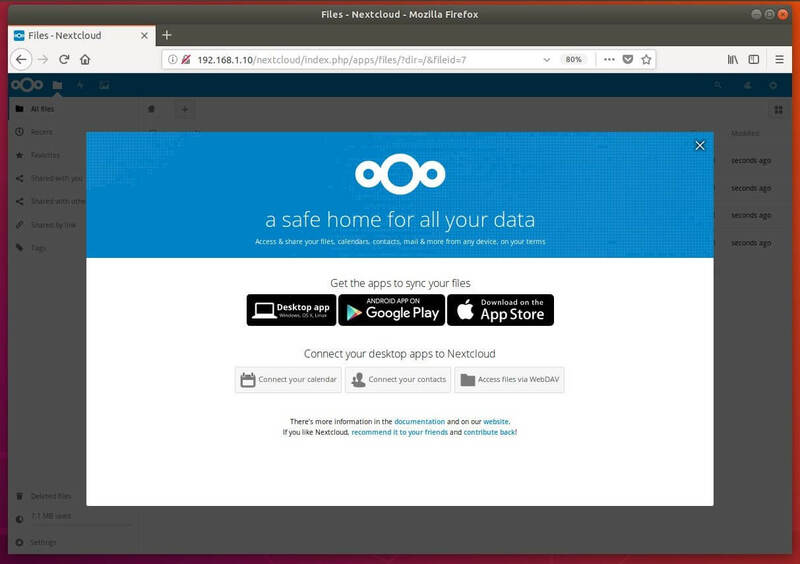 NextCloud Enterprise is also available with full enterprise support, including phone and email access to Nextcloud developers. 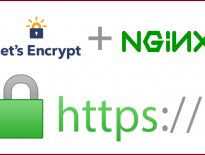 Share your files with the others and protect the public links with a password. Tracking changes to your files. Access files stored in external cloud storage service providers such as Amazon, Google, and Dropbox. You can install Nextcloud on Ubuntu using Snap or LAMP stack. You can easily install Nextcloud using the Snap command. The Nextcloud installation may take few minutes to complete. 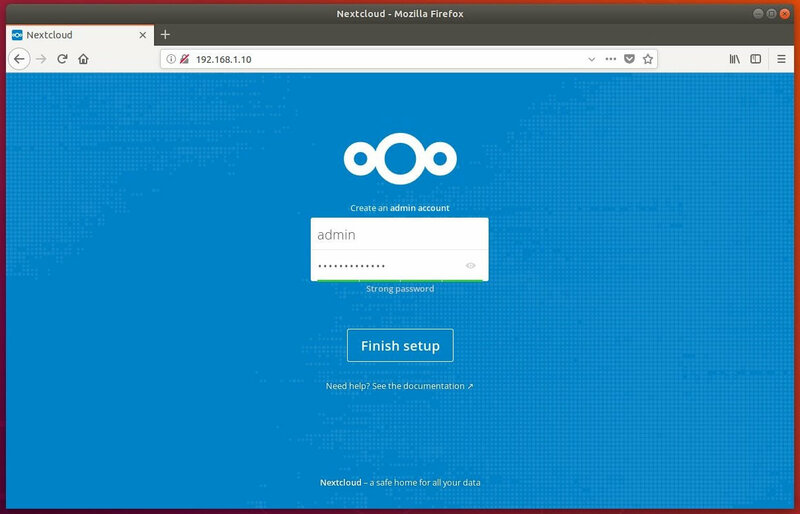 Verify the Nextcloud installation using the below command. Open a browser and navigate it to Nextcloud URL. Create an admin account then click Finish setup. 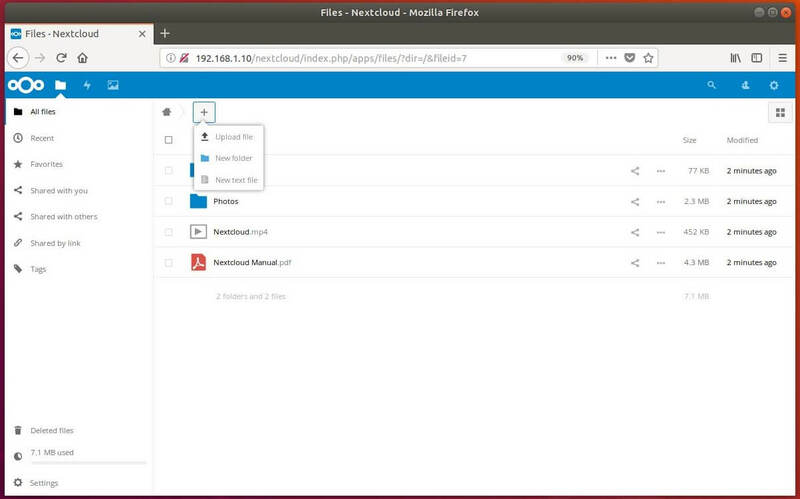 You will now get the home page of Nextcloud where you can upload or download your documents. We will install the necessary PHP extension for NextCloud. Now, we will install Apache web server and MariaDB server for Nextcloud. You need to enable few modules to get NextCloud work properly. You can also enable additional Apache modules. NextCloud offers you the zipped archives for server admin’s to download and manually set it up on top of a LAMP stack. Update the ownership of files inside the NextCloud root directory so that web server can write data into it. 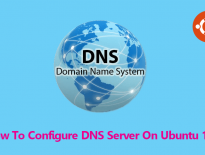 Ensure MariaDB server service is running. Log in to MariaDB server using the root user to create a database. You do not need to enter the root password when you execute the mysql with sudo, and just press enter when MariaDB prompts for the root password. 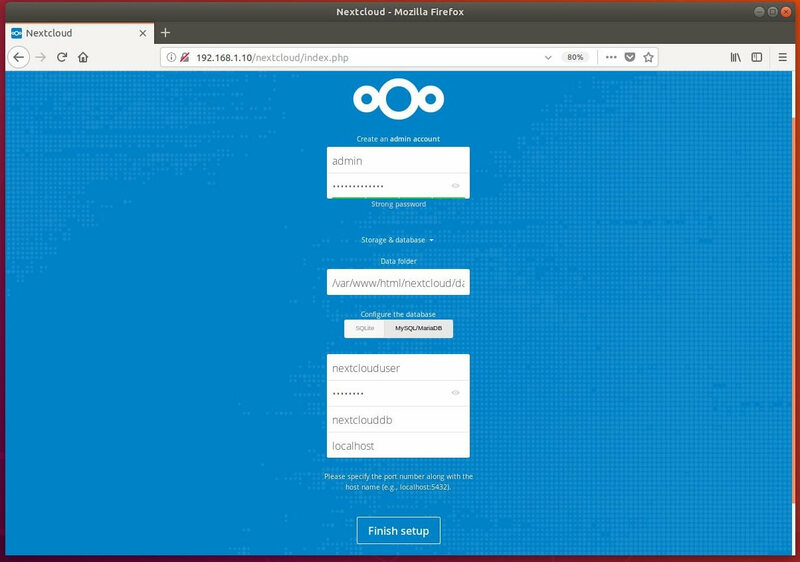 Open a web browser and navigate to it Nextcloud setup. Fill up the setup page with admin information for creating an admin account and the location of the data folder. You can choose either SQLite or MySQL. If you decided to use SQLite database, then you do not have to enter database details. Using SQLite server in a production environment is not recommended, so, we will use MariaDB here. Enter the database details in the below page. 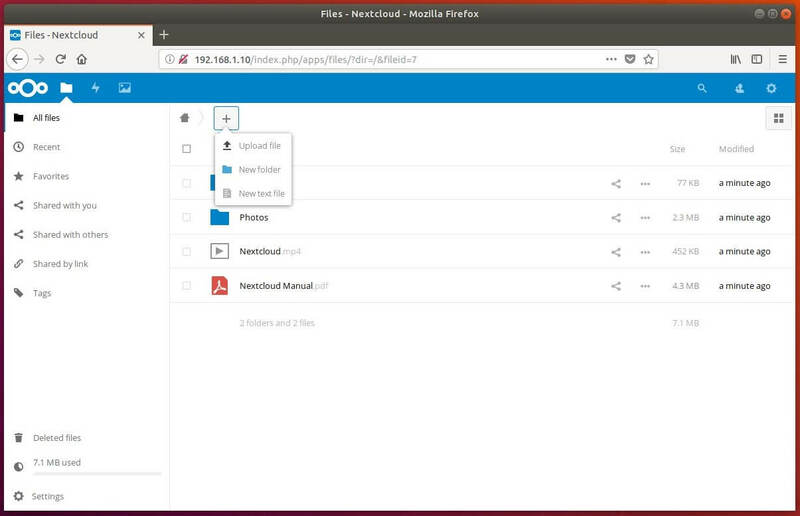 Alternately, you can download the NextCloud clients available for Desktop, Android, and iOS to sync documents across your devices. 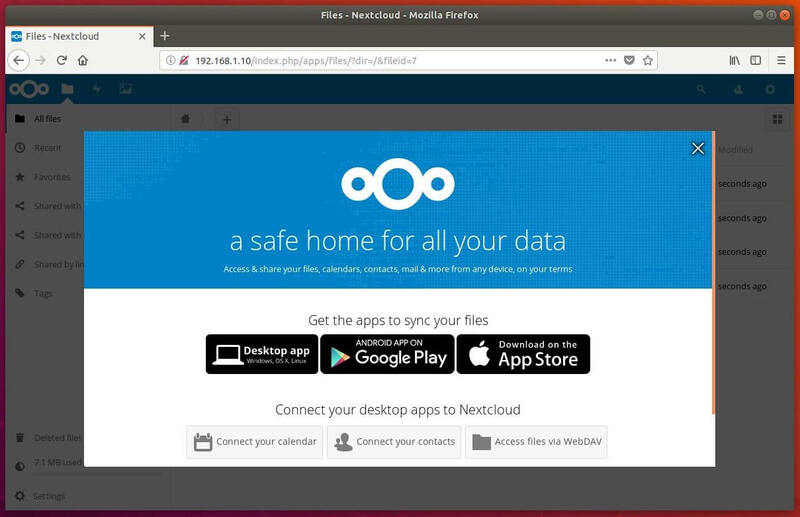 Install NextCloud on Ubuntu 18.04 using LAMP Stack – Nextcloud AppsOn the home page of NextCloud. Clicking “+ sign” button and then Upload to begin uploading the files.